These comfortable foot cushions are lightweight and help to protect the skin and heels from pressure sores. Made of a soft poly / cotton with polyester fiberfill these are a cost effective product to aid in the prevention of bed sores. 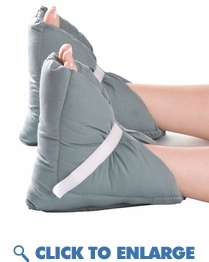 The foot cushions are machine washable. One size fits all. Universal for both feet.